Audio Scope is a dual-trace digital oscilloscope, that runs at the audio sampling rate of the device, 48kHz. As such, it is well suited to observe lower frequency audio waveforms, but will not show much detail above approximately 8000 Hz. Samples mode is the normal scope mode, where time is on the X-axis, and level is on the Y-axis. X-Y mode uses the left channel for the vertical axis magnitude, and the right channel for the horizontal channel magnitude. You can select the digital gain to be applied to both input channels by using the Gain picker in the lower left-hand corner of the screen. Choose from 1X to 128X gain. Signals that clip will be shown as pressed against the top or bottom of the display. Select the time axis by using the ms / div picker in the lower right-hand corner of the screen. Selecting 1ms / div will show 10ms of time across the screen. Select the Input Source on the Setup page. 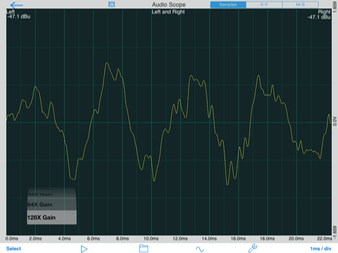 If you select Left, Right, Sum (adds the inputs), or Difference (subtracts the right channel from the left channel), the scope will be in single-channel mode (one green line). Left & Right will put the scope into dual-channel mode, where the right channel trace is shown in yellow. Swipe vertically on the screen to show a red cursor. This line defines the trigger threshold. Signals above this line will re-trigger the scope. On the Setup screen (accessed by tapping the wrench icon), you can turn on Single-Sweep trigger mode. When on, the scope will trigger only once, and then hold the captured signal. Double-tap the screen or tap the Play/Pause button to re-arm the trigger. The level of the signal is shown on the scale on the right side of the screen. You can select the desired units on the Setup page. Note that the display will only be calibrated when using an input device, such as iAudioInterface. This mode uses the left channel signal to drive the scope vertical trace, and the right channel signal to drive the horizontal trace. You can use this mode to examine the phase relationship between the left and right channels.\n\nSignals that are in phase will create a straight line from the lower left corner to the upper right corner. Signals that are 180 degrees out of phase will show up as a line from the upper left corner towards the lower right corner. A signal whose right channel is 90 degrees later than the left channel will display as a perfect circle. You can observe music, and see that the tighter the line from lower left to upper right, the more phase coherent is the music.\n\nIn this mode, the Gain control works the same as in Sample mode, but the ms / div control works to control the amount of time that the scope shows with each trace. For example, 1ms / div shows 10ms of activity, and 5ms shows 50ms of activity per retrace.\n\nNote that a stereo (two-channel) signal is required for this mode.